Forever 21 just got in serious spring accessories. Yesterday they were putting out lots of necklaces, like these on the left ($6.80). Avoid others that expose cheap hardware. But some are no-brainers, like the long, colorful wooden baubles. There's great hues, geometric shapes and, for now, plenty to choose from. Visit before the weekend. Even the earrings have some winners; I like the big colorful wooden hoops. Thanks, spring ethnic trend. And lately I've seen many Forever 21 bags that have tempted close inspection. Some are not totally flimsy looking, like this satchel tote, left, for $32.80. Apply the same hardware principle from above. The bags are priced $20 and up. 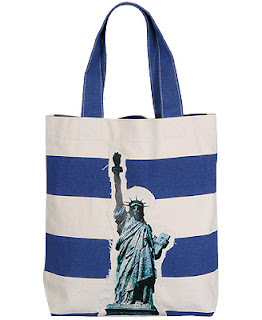 I'm going back to look for this tote, found on their website, right: perfect hip irony for the Rockaways and Coney Island. I'll let you know if/when it's in store. What couldn't I resist at Forever 21 yesterday? Scarves. Check out the long plaid ones on the second floor near the Heritage Collection (right off the escalator and through accessories); they come in blue, green and pink. 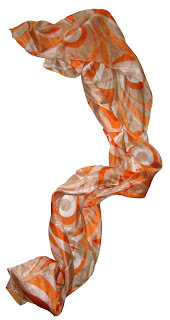 And here's a great scarf shape, left, perfect for your hair or worn around the neck, it also comes in brown ($6.80).